Taking an infant grocery shopping (or any other kind of shopping that involves a cart) can be difficult. There's not much room for the baby carrier in the cart, and there's less room for groceries when the baby carrier is popped into the bottom of the cart. So, what do you do? Invest in a shopping cart hammock! 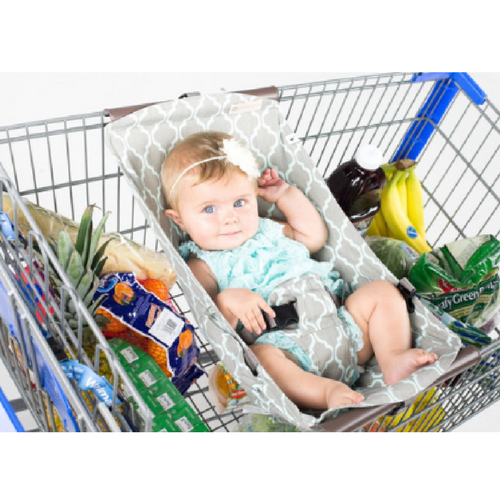 With a shopping cart hammock, your baby is safely secured in the cart while leaving you plenty of room to store shopping items underneath. Simply attach to the cart and fasten baby into it. One thing to note though is that they only fit carts facing one direction due to the taper of shopping carts, so be sure to install with the "front" tag facing the front (or nose) of the cart. 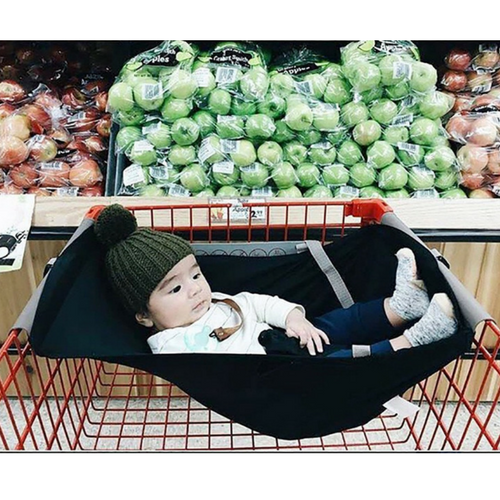 The Binxy Baby Shopping Cart Hammock is adorable, comfy, and available in 7 different shades/patterns from Fab Baby Gear. The price is a bit steep at $64.99 but everyone who has one says it's worth every penny. While the Binxy Baby Hammock can be found on Amazon.ca, it isn't always available. And the best price I've found is direct from Fabbabygear.com ($64.99). Making this hammock even better is the fact that most infant car seats also sit snugly inside if you don't want to take baby out of their seat (because they're sleeping or still super tiny) and can be secured using the included safety strap. The Binxy hammock meets or exceeds all applicable safety standards. Shipping is free if you spend over $75, (some exceptions apply) otherwise will range from $12 - $15 for most Canadians. You can check out the shipping fees here. The AiQi Shopping Cart Hammock is the only other version of the Binxy I've been able to find. You can get it on Amazon.ca for the lower price of $49.95 shipped. Do you have a shopping cart hammock? Tell us what you think in the comments below!